Sweet ‘n’ sour is a pretty popular Chinese dish, and it’s easy to see why. A juicy sweet sauce with a delicious tanginess, it’s a popular choice amongst both vegans and omnivores alike, especially when paired with the usual deep fried veggies or tofu. 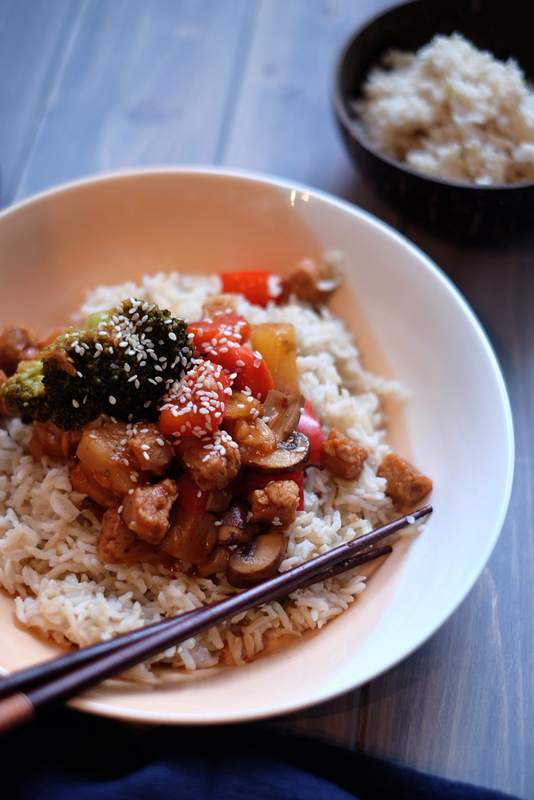 This homemade vegan sweet and sour recipe doesn’t involve anything fried, but it does taste like the traditional sweet and sour sauce you’d find in an Asian restaurant, and it’s totally healthy too! Though I’ve been sitting on this sauce recipe for a while, I found now was the perfect time to share it with you guys as part of my collaboration with Buy Wholefoods Online. The guys kindly gifted me some of their wonderful textured vegetable protein (TVP), and I think this recipe is a perfect way to incorporate this useful protein into your diet. Of course, you can also make this recipe without the TVP and just the veggies if you like, or you could even replace TVP with your own preferred protein source, like tofu. Textured vegetable protein (or TVP) is a dried protein sauce made entirely from soybeans. Though the name may not sound that appetising, it’s actually highly nutritious and a complete protein, making it incredibly handy for those on a plant-based diet. TVP is made from defatted soy flour, which is then pressure-cooked and dried before being made into various shapes. Available as chunks, mince, strips and pieces, TVP is a fantastically versatile ingredient for replacing meat in your typical omnivorous dishes and much lower in fat and cholesterol. It’s also a great source of dietary fibre, iron, magnesium and phosphorous. While TVP can definitely be part of a nutritious, healthy vegan diet, it’s important to remember that it is still a processed soy product. Soy is a great food but is always best consumed in its minimally processed forms, such as tempeh, tofu, tamari and edamame beans. So TVP is something that should be consumed on an occasional basis, and not as your main protein source. If you are curious about using TVP in the kitchen, aim for organic TVP over non-organic, as that means fewer (basically none) chemicals will have been used in the defatting process. For this recipe, I’m using TVP chunks from Buy Wholefoods Online. Alternatively you may also find TVP at your local health shop. The main thing I love about this sweet & sour recipe is that it doesn’t require ketchup. Now, I have nothing against ketchup by any means, but sometimes you might be caught without it, and it’s surprising how many sweet and sour recipes call for it as a main ingredient. This vegan sweet and sour sauce is also super speedy to whip up. 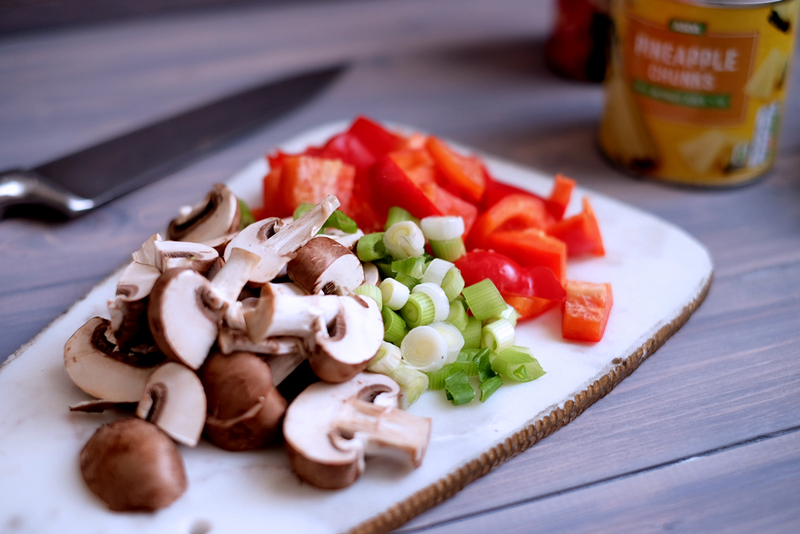 Just blend together and toss over some stir-fried veggies, allow to thicken and voila! No need to reach for the takeout menu. 565g can pineapple chunks, juice saved. Place the TVP chunks in a bowl and cover with hot water. Let sit for about ten minutes to rehydrate. In the meantime, chop up the vegetables and sauté in a little water in a pan on medium-high heat. When they begin to go soft, add a sprinkle of tamari or soy sauce for flavour, add the pineapple chunks and stir together. Blend up all of the sauce ingredients in a high speed blender. Drain the TVP chunks in a colander. Using clean hands or a paper towel, gently squeeze each piece to remove all of the excess water. Add to the stir fry and cook until warmed through. When vegetables are cooked, pour in the sauce (as much as is needed). Increase the heat to high so that sauce thickens up. Taste and add a pinch of salt and pepper if needed. If you like your sweet and sour very saucy, feel free to add more sauce. However, feel free to hold some back and freeze for another day. Simmer on low for about 5-10 minutes to allow veggies and TVP to soak up the flavours. Serve with brown rice or noodles of choice. 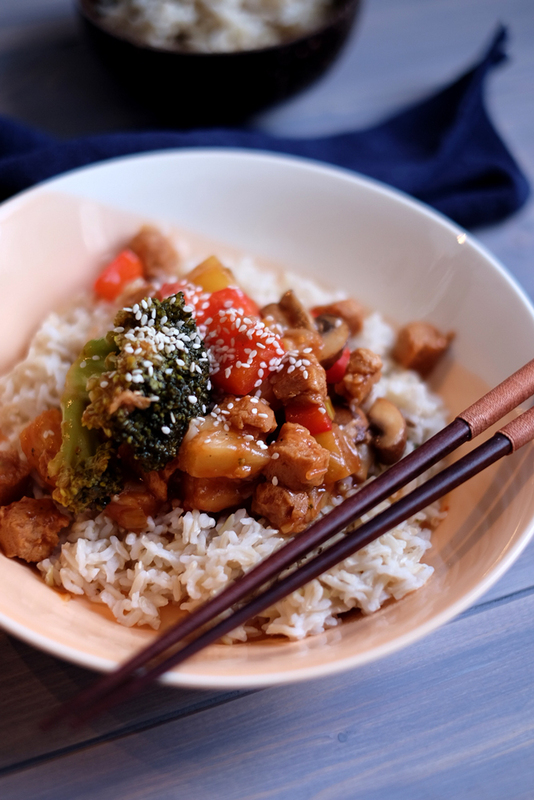 What did you think of this vegan sweet ‘n’ sour recipe? Feel free to let me know any questions or thoughts in the comments below, and if you make it, don’t forget to tag me – #everythingspeachy.